This update is brought to you by Mike's wallet which is now noticably lighter. After tonight I can cross off another item from my long list of things I must do/eat/try in Japan. 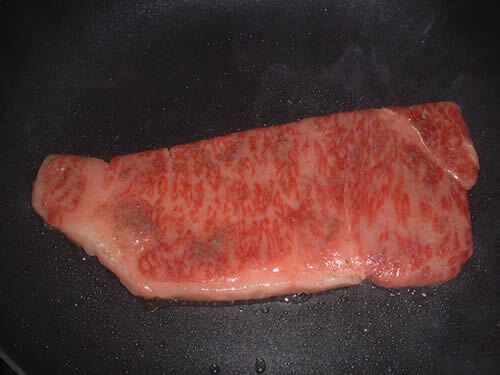 Actually I have to be honest, the beef wasn't actually from Kobe but another prefecture in Japan called Iwate. 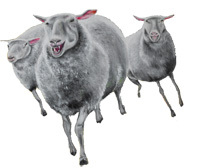 But after some research I came to understand that Kobe beef isn't even the best or most famous in Japan. 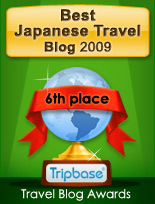 That award would probably go to either Yonezawa beef from Yamagata or Matsusaka beef from Mie. 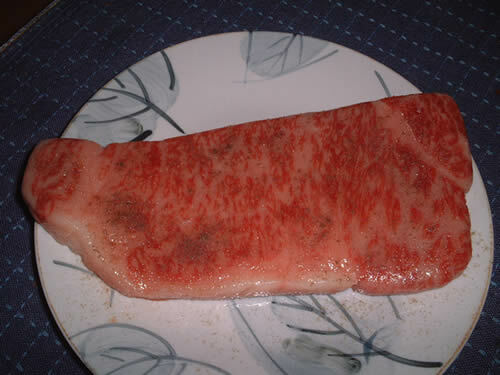 I titled this article Kobe beef because it is the most well known outside of Japan and therefore better for grabbing your attention. Anyway putting where the cows are from aside, what's more important is the beef's characteristics, and these are mostly the same regardless of it's origin. What's really famous is the intense marbling of the beef so that it appears to be almost white, with a few red speckles of meat seemingly thrown in as an afterthought. You can see what I mean below, here's my 150g steak which set me back 3460 yen. Yep, so that's roughly $35.00 for a small steak, talk about living the good life! I decided to check on the internet the best way to cook my steak, and it's a damn good thing I did cuz I would've wasted my money otherwise. First point that they rub into you, what you've got isn't actually a steak per se, you have to think of it more like fois gras, or even better, ice cream. Cooking it on a grill would be a waste because all the fat would drip away and you'd be left with leather. What you need to do is sear the outside on a super hot pan and leave the inside raw. Here we go! So what goes well with Kobe beef? 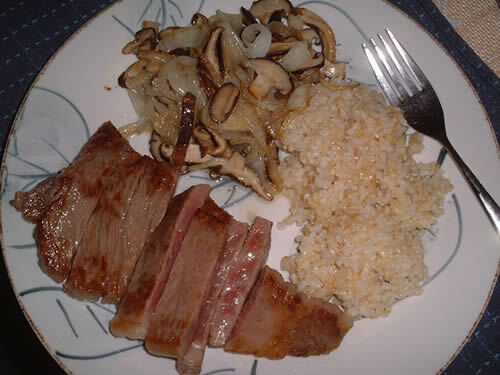 Thinking in terms of 'steak', I decided to eat it with some nice fried mushrooms and onions and a side of brown rice, mistake! The taste is so smooth and delicate that the other foods overpowered it. I ended up eating the steak alone and the rice, mushrooms and onions after. So what do you eat it with then? Maybe nothing, just eat it alone like you would a chocolate bar. So what the final verdict on this delicacy? Yes that is a thumbs up sign so you can assume it wasn't disgusting. 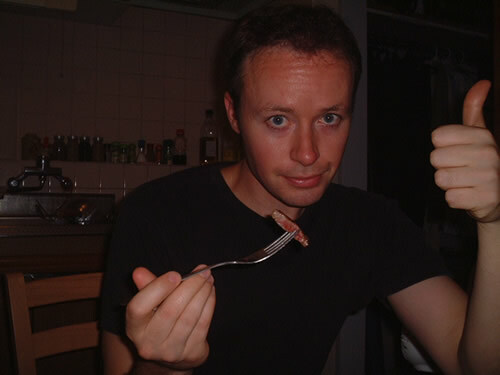 However during my first bite, I bit the inside of my mouth which seriously pissed me off and perhaps lowered my enjoyment level a bit. I think I also could've cooked it a bit longer as it was only warm when I ate it, steaks should be hot! Ok, sure it was good, there was no gristle at all, and the pieces really seemed to melt in my mouth, but so rich! Kinda like eating a stick of butter (although tastier and more satisfying). However, I think perhaps that in the long run, I'd prefer a regular ol' Canadian steak. So will there be a next time? Nah.